Singularity of Origin is a tool to perform DNS rebinding attacks. It includes the necessary components to rebind the IP address of the attack server DNS name to the target machine’s IP address and to serve attack payloads to exploit vulnerable software on the target machine. It also ships with sample payloads to exploit several vulnerable software versions, from the simple capture of a home page to performing remote code execution. It aims at providing a framework to facilitate the exploitation of software vulnerable to DNS rebinding attacks and to raise awareness on how they work and how to protect from them. How Do DNS Rebinding Attacks Work? DNS rebinding changes the IP address of an attacker controlled machine name to the IP address of a target application, bypassing the same-origin policy and thus allowing the browser to make arbitrary requests to the target application and read their responses. The Singularity DNS server is responding with short time to live (TTL) records, minimizing the time the response is cached. When the victim browses to the Singularity manager interface, the Singularity’s DNS server first responds with the IP address of Singularity itself where the client-side code (payload) is hosted. When the DNS record times out, the Singularity DNS server responds with the IP address of the target host (e.g. 127.0.0.1) and the victim’s browser can access the target application, circumventing the browser’s same-origin policy. 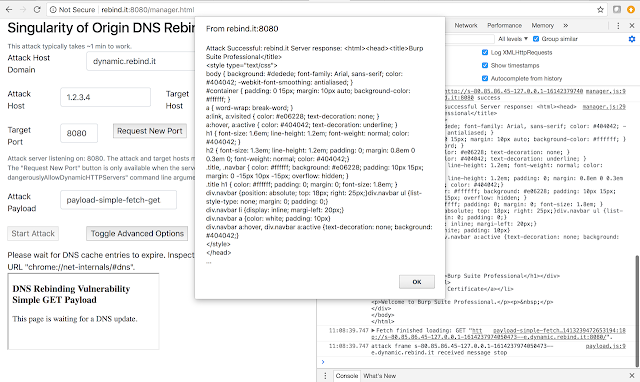 It is also possible to trigger DNS rebinding before a cached DNS record expires, depending of the target platform and using a combination of techniques that are described in later sections. Several sample attack payloads, ranging from grabbing the home page of a target application to performing remote code execution. These payloads can be easily adapted to perform new and custom attacks. 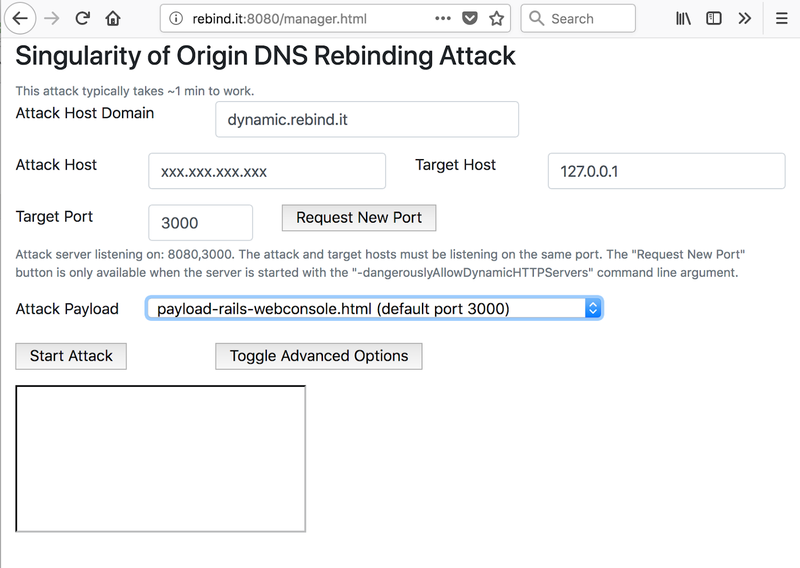 Near instant rebinding for several browser and OS combinations, using multiple DNS answers and dynamic HTTP port blocking. A convenience feature to avoid restarting Singularity to listen on a different HTTP port. To lay the ground work to attack vulnerable ports discovered after a scan. A DNS domain name from a domain registrar such as gandi or namecheap. You need be able to add and edit your own DNS records for your domain. A Linux server instance from a hosting provider such as Linode, Amazon AWS, Google Cloud, Microsoft Azure etc. Let’s say that we want to retrieve the homepage of a tool listening on localhost, port 8080, of a victim desktop machine from domain “dynamic.your.domain.” You personally own/manage domain “your.domain.” You will mount attacks from a server with IP address “ip.ad.dr.ss“. This server will run the Singularity DNS and HTTP servers. This sample setup informs DNS clients, including browsers, that “ip.ad.dr.ss” answers queries for any subdomains under “.dynamic.your.domain.“, e.g. “foo.dynamic.your.domain.”. This also permits one to access the Singularity management console using the “rebinder.your.domain” DNS name with a web browser. Follow the instructions from the official Go Programming Language web site. Deploy the “html” directory in let’s say “~/singularity”. Deploy the singularity-server binary in “~/singularity”. Start singularity-server with sudo ./singularity-server --HTTPServerPort 8080. This will use a DNS rebinding strategy based on the content of the DNS query by default e.g. s-ip.ad.dr.ss-127.0.0.1-<random_number>--e.dynamic.your.domain will return first “ip.ad.dr.ss“, the attacker host IP address, then “127.0.0.1” for subsequent queries for a limited period of time. Note: You will need to verify that other services do not listen on ports required by Singularity. On Ubuntu 18.04 LTS, by default, systemd-resolved is listening on the localhost UDP port 53. This will prevent Singularity from starting. Disable systemd-resolved with this command: sudo systemctl disable --now systemd-resolved.service. Next, update the file /etc/resolv.conf to make sure it does not contain nameserver 127.0.0.53 but something like nameserver 8.8.8.8. Replace 8.8.8.8 with the IP address of the DNS server of your choosing (e.g. nameserver 169.254.169.254 on GCP). Singularity requires multiple ports exposed to the Internet (or at least to the network from which you access the tool via your browser). The minimum required ports are UDP 53 for DNS and the port where the Singularity manager web interface is running. The default port for the manager web interface is TCP port 8080. Additionally, Singularity requires that the payload is served from the same port where the vulnerable/exploited application is running on to not violate the same-origin policy. Minimum required ports are listed above. Deploy a local test service with python -c 'import BaseHTTPServer as bhs, SimpleHTTPServer as shs; bhs.HTTPServer(("127.0.0.1", 8080), shs.SimpleHTTPRequestHandler).serve_forever()' from a directory containing some test data files, on your client machine. The content of your victim host directory should be displayed within a few seconds/minutes in an alert box. We will add more platforms as we test them. We elected a delay of 3s to perform DNS rebinding to cater for targets with a poor connection to the internet/network. When Singularity is run without arguments, the manager web interface listens on TCP port 8080. Browse to that port to configure and launch the DNS rebinding attack. Singularity comes with a default configuration file in html/manager-config.json. You can modify this file to change the default parameters, such as the attackHostDomain, the attackHostIPAddress, and the attackPayloads. You need to edit this file if you add your own payloads. You do not need to edit the configuration file if you want to use existing payloads as you can change the parameters in the web interface. Launch the Singularity binary, (singularity-server), with the -h parameter to see its parameters. -ResponseIPAddr string : Specify the attacker host IP address that will be rebound to the victim host address using strategy specified by flag -DNSRebingStrategy (default value is 192.168.0.1). -ResponseReboundIPAddr string : Specify the victim host IP address that is rebound from the attacker host address (default value is 127.0.0.1). -dangerousAllowDynamicHTTPServers Specify if any target can dynamically request Singularity to allocate an HTTP Server on a new port. This feature may be dangerous as it allows opening new ports via the unauthenticated web interface. -responseReboundIPAddrtimeOut int : Specify a delay in seconds for which we will keep responding with Rebound IP Address after the last query. After the delay, we will respond with ResponseReboundIPAddr. The default is 300 seconds. Request New Port This will request Singularity to listen on a new port. This feature is only available when Singularity has been started with the -dangerouslyAllowDynamicHTTPServers command line option. Attack Payload This is where you select the payload, i.e. which application you are trying to exploit. Start Attack Start the DNS rebinding attack. Be patient and wait for at least one minute. Open the browser web console to see debugging logs. Toggle Advanced Options This button will enable the advanced fields described below. Basic fetch request (payload-simple-fetch-get.html): This sample payload makes a GET request to the root directory (‘/’) and shows the server response using the fetch API. The goal of this payload is to function as example request to make additional contributions as easy as possible. Basic XHR request (payload-simple-xhr-get.html): Another sample payload to make a GET request to the root directory (‘/’) and showing the server response using XMLHttpRequest (XHR). Chrome DevTools (payload-exposed-chrome-devtools.html): This payload demonstrates a remote code execution (RCE) vulnerability in Microsoft VS Code fixed in version 1.19.3. This payload can be adapted to exploit any software that exposes Chrome Dev Tools on localhost. etcd (payload-etcd.html): This payload retrieves the keys and values from the etcd key-value store. pyethapp (payload-pyethapp.html): Exploit the Python implementation of the Ethereum client Pyethapp to get the list of owned eth addresses and retrieve the balance of the first eth address. Rails Web Console (payload-rails-webconsole.html): Performs a remote code execution (RCE) attack on the Rails Web Console. Creating your own payloads is as simple as copying the sample payload HTML file (payload-simple-fetch-get.html) and modify it according to your needs. The sample payload makes a single GET request and displays the response. Start with copying the content of this file to a new .html file and add its name to the attackPayloads list in the manager-config.json file. Then modify the new HTML file to change the request URL for example. DNS rebinding attacks can be prevented by validating the “Host” HTTP header on the server-side to only allow a set of whitelisted values. For services listening on the loopback interface, this set of whitelisted host values should only contain localhost and all reserved numeric addresses for the loopback interface, including 127.0.0.1. For instance, let’s say that a service is listening on address 127.0.0.1, TCP port 3000. Then, the service should check that all HTTP request “Host” header values strictly contain “127.0.0.1:3000” and/or “localhost:3000”. If the host header contains anything else, then the request should be denied. Depending on the application deployment model, you may have to whitelist other or additional addresses such as 127.0.0.2, another reserved numeric address for the loopback interface. For services exposed on the network (and for any services in general), authentication should be required to prevent unauthorized access. Filtering DNS responses containing private, link-local or loopback addresses, both for IPv4 and IPv6, should not be relied upon as a primary defense mechanism against DNS rebinding attacks. Singularity can bypass some filters in certain conditions, such as responding with a localhost CNAME record when targeting an application via the Google Chrome browser for instance. Use the -DNSRebindStrategy DNSRebindFromQueryRandom DNS rebinding strategy instead of the default - DNSRebindStrategy DNSRebindFromQueryFirstThenSecond if you suspect the presence of an IDS in one or more environments that sends several DNS requests to the attack server in addition to the actual target. This will ensure that the target will eventually obtain the required IP address, albeit a bit more slowly. Singularity responds with a DNS CNAME instead of an A record if one specifies “localhost” as the target instead of “127.0.0.1”. This may work around DNS filtering of responses containing “127.0.0.1”, at least on Chrome and Firefox. Chrome & Firefox appear to look at their internal database upon reception of the CNAME record containing “localhost” instead of making another DNS lookup. Chrome populates its DNS cache with both “127.0.0.1” and “::1” in particular. Related: https://tools.ietf.org/html/draft-west-let-localhost-be-localhost-06. Similarly, specifying “0.0.0.0” on Mac and Linux, which corresponds to “this host, on any interface” on these platforms may work around some filters/controls. Cross-platform compilation: go to “~/singularity/cmd/singularity-server/” and type env GOOS=linux GOARCH=amd64 go build for a Linux build or go build from a mac OS machine for a Mac build. The fetch API based attack scripts in the “html” directories will stop after 5 attempts if there are network errors. Going to chrome://net-internals/#dns in the Chrome browser is great for debugging. sudo ./singularity-server -HTTPServerPort 8080 -HTTPServerPort 8081 -dangerouslyAllowDynamicHTTPServers starts a server on port 8080 and 8081 and enables requesting dynamically one additional HTTP port via the Manager interface. Testing a service for a DNS rebinding vulnerability: In an HTTP intercepting proxy such as Portswigger’s Burp Suite, replay a request to localhost, replacing the host header value e.g. “localhost” with “attacker.com”. If the request is accepted, chances are that you have found a DNS rebinding vulnerability. What you can do after, the impact, depends on the vulnerable application. Use the DNSRebindFromQueryMultiA strategy for instant rebinding when supported by the target browser/OS combination and with the tested settings, summarized in the table above. The DNSRebindFromQueryMultiA rebinding strategy does not support the “localhost” target value if trying to evade IPS/IDS and DNS filters.